For the Abbotsford brewery's venture into the land of aluminium, they've created a new beer and are sending it out into the world in ten-packs (very well priced ten-packs if some of the activity we've seen online is any guide), presumably as it's a good size for taking out into the wilds over summer. 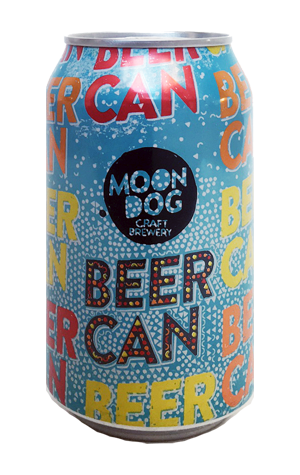 Beer Can also comes with typically eye-catching livery; we thought it was heading along an Aztec / Inca bent, although we're told our arrow was slightly off target as it's "Mexican fiesta". Now we can't think of any Mexican lagers that are popular in Australia, particularly in Summer. But, if we could, this isn't it. For, while few would have predicted a story arc for Moon Dog in their first few years in which they'd ultimately release a 4.2 percent ABV lager (or indeed a range of three 5 percent core beers, or buy a 70 hectolitre brewery), this is one that comes with cold press tropical fruit juice added in the whirlpool and the Falconer's Flight hop blend originally designed for West Coast US style IPAs. As a result, while it's very much a quaffer, there's plenty of grapefruit and peach fruit character and enough weight and resinous bite to place it some distance away from less jazzily coiffured Mexican lagers.